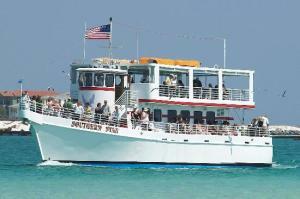 Destin Florida | Destin Florida Attractions, Events, Dining and things to do. There’s a place where the sands are whiter, where the waters are bluer, where the living is freer, where the people are happier – that place is Destin, Florida. Destin, situated next to the upscale régime of Miramar Beach and the rather rural splendor of Santa Rosa Beach, is the vacation destination of choice for discriminating families and retirees who desire a comfortable lifestyle. In the minds of those outside the Emerald Coast area, “Destin” is code for all the fun and luxury that the area between Fort Walton Beach and Panama City Beach offers. Destin is a place and a state of mind, an Emerald Coast state of mind that exists between Pensacola and Panama City. Destin is more than just another coastal city, more than just a zip code – it’s a lifestyle and a way of taking in life to the fullest. Destin proper, with a total area of only 8.2 square miles, is located on a peninsula that separates the Gulf from Choctawhatchee Bay and was a barrier island until altered sea levels connected the area with mainland. 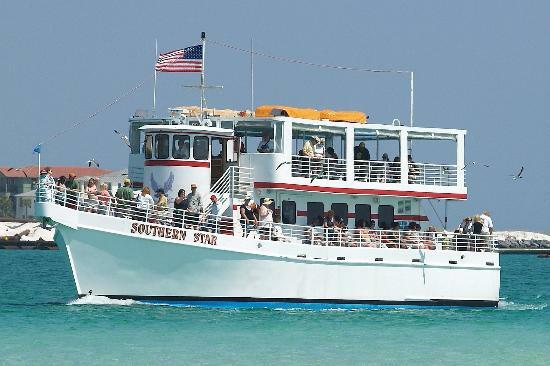 Destin began as a small fishing village and still has the biggest fishing fleet in Florida. The city was named after Leonard Destin, a fishing captain from Connecticut who came to the area in 1850. Although condos began to pop up in the area in the 1970’s, Destin was not officially incorporated as a municipality until 1984; however, growth has been rapid—much to the chagrin of some residents—since the 1980’s. The current population is approximately 13,000 persons, but expands to nearly 50,000 people during high tourist season. Destin and the surrounding areas draw more than 80% of the yearly 4.5 million tourists to the Emerald Coast (according to the Florida Department of Environmental Protection). There are 12 access points to the beach in the city, including Henderson Beach State Recreation Area and part of Gulf Islands National Seashore. 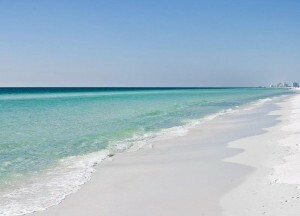 Destin has some of the whitest sand in the world. Coming down from the Appalachian Mountains, making its way down the Apalachicola River and settling into the Gulf of Mexico, made of fine crushed quartz crystals, the sand in the Emerald Coast looks like pure white sugar…hence the reference to Destin’s “sugar beaches.” These sugar beaches run from Panama City to Pensacola, and lovely the Destin area sits right in the middle of this natural wonder. Henderson Beach State Park — For a small admission fee, you can have a long stretch of beach all to yourself. — 7000 Emerald Coast Pkwy, Destin, FL 32541, 850-837-7550. Crystal Sands Beach — Walking this beautiful beach is a real treat since views like this are rapidly disappearing. Sort of a hidden beauty. Jetty East Beach – A hidden treasure…. James Lee Park — At the beach on the Walton/Okaloosa County line, this sizable park has 3 pavilions, 41 picnic tables, 9 dune walkovers, a playground, restrooms with changing rooms, and 166 parking spaces. Topsail Hill Preserve State Park – Near Destin at 7525 W. Scenic Highway 30A, Santa Rosa Beach, FL 32459, (850) 267-8330. Topsail Hill has a wide range of natural resources including over 3 miles of out-of-the-way, white sand beaches with splendid dunes over 25 feet tall. Three exceptional coastal dune lakes offer excellent freshwater fishing. Boats are not allowed, but there is fishing from the shoreline for bass, bream, pan fish, and catfish. Enjoy the old-growth long leaf pines, sand pine scrubs, and an assortment of wetlands for bird-watching or a hiking heaven. An RV resort has a swimming pool and shuffleboard courts. Furnished bungalows are available. Hilton Sandestin Beach — A cherished home-away-from-home for numerous guests over the past 30 years. Sandestin numbers among the celebrated beaches of South Walton, and Hilton Sandestin Beach is the Emerald Coast’s largest full-service beachfront resort, made with families in mind, a favorite Destin family vacation resort. At 4000 Sandestin Boulevard South, Destin, Florida 32550, 1-800-559-1805 or (850) 267-9500. Hidden Dunes Beach & Tennis Resort – A premier natural beach and tennis resort. At 9815 Hwy 98 W, Destin, FL 32550, (800) 225-7652. Henderson Park Inn – Named #1 Most Romantic Hotel in North America & #2 Most Romantic Hotel in the World by About.com. A leading Destin hotel and a preferred romantic escape with the unspoiled charm and grace on the serene shores of the enchanting Emerald Coast. At 2700 Scenic Hwy 98 East, Destin, FL 32541, 866-398-4432. Residence Inn Sandestin at Grand Boulevard – An extended stay hotel in Destin, Residence Inn offers restored suites and a friendly lobby area. Pets are welcome, free WiFi in all suites and common area. At 300 Grand Blvd, Destin, FL 32550, 850-650-7811. Village of Baytowne Wharf – The Heart and Soul of Sandestin, the Village of Baytowne Wharf lies along the shores of Choctawhatchee Bay. It has a selection of boutiques, restaurants, galleries, night life, and a full schedule of outdoor festivals and distinct events for the whole family. At 9300 Emerald Coast Pkwy W, Destin, FL 32550, 850-267-8000. Embassy Suites Destin-Miramar Beach — A very nice hotel! At 570 Scenic Gulf Dr., Destin, FL 32550, 855-277-4940. Topsl Beach and Racquet Club – A tranquil beach and racquet resort in Miramar Beach, 10 miles east of Destin, in the Sandestin area. Enjoy the harmony of a place off the ordinary path and still enjoy the conveniences of Destin. Topsl is 52 private acres, a full-service, award-winning alternative to the mainstream. At 9011 Emerald Coast Pkwy W, Destin, FL 32550, 850-267-9222. Silver Beach Towers Resort — A family-centered, high-end, Gulf-front condominium resort in the center of Destin, Silver Beach offers 600 feet of private white sand beaches and many other amenities. At 1048 Highway 98 E, Destin, FL 32541, (850) 269-1005. Buccaneer Pirate Cruise – At 88 US Hwy 98 East, Destin, FL 32541, 855-269-0896. Destin Harbor Boardwalk & Marina – Great place to spend the day. 66 Harbor Blvd., Destin, FL 32540. 850-337-8250 and 850-83-4242. Village of Baytowne Wharf – Sandestin Resort destination. A major point for activities and family events in the area. 800-622-1038. Destin History & Fishing Museum — Experience historic and educational exhibits detailing early Destin life from the 1830s. 108 Stahlman Ave, Destin, FL 32541, 850-837-6611. The Track Family Recreation Center – Features Party Packages, Go Karts, Miniature Golf, Bumper Boats, Bumper Cars, Kids Country, Bungee, Sky Flyer, and Games. — 1125 Highway 98, Destin, FL 32541, 850-654-4668. Note: Two major entertainment events in the area include the Destin Fishing Rodeo and the Destin Seafood Festival, both in October. Beach Walk at Henderson Park Inn: For a wonderful experience and outstanding American, Asian, French & Italian cuisine, this is the spot for Gulf-front fine dining. 2700 Scenic Highway 98, Destin, FL 32541, (850) 650-7100. Vintij Wine Boutique & Bistro: For French-inspired American cuisine and a large selection of fine wines all offered with friendly, intimate service, this is your dining spot for special coastal experiences. 10859 US Highway 98 W, Ste 103, Destin, FL 32550 — (850) 650-9820. McGuire’s Irish Pub: For big pub food at a great price in a fun environment, this is the place for family good times. Great for families with children and large groups. 33 Harbor Blvd, Destin, FL 32541, (850) 650-0000. Buck’s Smokehouse – When you want your meat done right! 303 Harbor Blvd, Destin, FL 32541, (850) 837-3600. Capriccio Café – Just the right spot for a lovely lunch with friends. 810 Hwy 98, Shoreline Village Mall, Destin, FL 32541 (formerly Capriccio restaurant) (850) 460-7050. Sarah K’s Gourmet – Who know how to do gourmet right? 34940 Emerald Coast Pkwy, Unit 183, Destin, FL 32541, (850) 269-0044. Mimmo’s Ristorante Italiano – For authentic Italian cuisine done right. 979 U.S. Hwy. 98 E., Destin, FL 32541, (850) 460-7353. Louisiana Lagniappe – For classic, inspired Cajun cuisine. 775 Gulf Shore Dr, Destin, FL 32541, (850) 837-088. Cuvee Bistro – Where all the classy people go to wine and dine. 36120 Emerald Coast Pkwy, Destin, FL 32541, 850-650-8900. Fat Clemenza’s Italian – A big hit with locals and tourists, authentic Italian done right. 12273 Us 98, Destin, FL 32550, (850) 650-5980. Donut Hole – A big hit with both locals and tourists, this breakfast and lunch winter has two locations: 635 Highway 98 East, 850-837-8824, and 635 Harbor Blvd, Destin, FL. Also a new location at 75 N Wall St, Panama City Beach, FL 32413, (850) 213-3127. Another Broken Egg Café – Scrumptious, unique breakfast and brunch twists on classic dishes. 979 HWY 98 E, Suite 4, Destin, FL 32541, 850-650-0499. Mitchell’s Fish Market Sandestin – Always the freshest catch! At 500 Grand Blvd, Suite 100k, Destin, FL 32550, (850) 650-2484. Pompano Joe’s Seafood – Huge favorite with tourists and locals with one of the best views on the Gulf Coast. At 2237 Scenic Gulf Drive, Destin, FL 32550, (850) 837-2224. Tuscany Italian Bistro – Upscale fine dining, when only the best classic Italian will do. At 36178 Emerald Coast Parkway, Destin, FL 32541, (850) 650-2451. Camille’s – Charming dining in an out-of-the-way spot. At 2931 Scenic Highway 98, Destin, FL 32541, (850) 337-8860. Seagar’s Prime Steaks & Seafood – High class meat done with style. Impress someone! At 4000 S Sandestin Blvd, Destin, FL 32550, (850) 622-1500. Ocean Club Restaurant – Classic fine dining for the classic crowd. At 8955 US 98, Miramar Beach, FL 32550, (850) 267-3666. Marina Café – Perfect for lunch with friends or a special someone. 404 Harbor Blvd, Destin, FL 32541, 850-837-7960. Landshark’s Pizza – Great food at a great price. 763 Harbor Boulevard, Destin, FL 32541, 850-424-6743. The Pancakery – Certified excellence in breakfast and café cuisine. 960 Hwy 98 East, Suite 104, Destin, FL, 850-269-0791. Bruster’s Ice Cream – Cure that craving for some first-rate ice cream! — 4655 Gulfstarr Dr, Destin, FL 32541, 850-269-2920. Graffiti & The Funky Blues Shack – Great food and great times, Cajun style! – 707 Harbor Blvd, Ste C-F, Destin, FL 32541, 850-424-7514. Tommy Bahama’s Restaurant & Bar – Upscale class in both food and clothing, a definite must-visit for the discerning crowd. 525 Grand Blvd, Destin, FL 32550, 850-654-1743. Jackacudas Seafood & Sushi – Florida seafood fresh, with a touch of the east. 56 Harbor Blvd., Destin, FL 32541, 850-424-3507. Buffalo Jack’s Legendary Wings & Pizza – Known for good food and fun, this place is a regular for locals and tourists. 11275 US Highway 98, Destin, FL 32550, 850-424-6288. Bonefish Grill – Always good, a great spot for families and groups. 4447 Commons Dr E, Ste 105, Destin, FL 32541, 850-650-3161. Shake’s Custard – Try something a little different. It’s not all about ice cream! — 1065 Highway 98 E, Destin, FL, (850) 269-1111. Boshamps Seafood & Oyster House – Fresh, friendly, depend on it. — 414 Harbor Blvd, Destin, FL 32541. Callahan’s Restaurant & Deli – When you want the all American touch. 791 Harbor Blvd, Destin, FL 32541, 850-837-7171. The Surf Hut – Barbecue and seafood fun. 551 Scenic Gulf Dr, Destin, FL 32550, 850-460-7750. The Back Porch – Local favorite since 1974. 1740 Old Scenic Highway 98 East, Destin, FL 32541. Destin Commons — Voted “Best Place to Shop” by Emerald Coast Magazine readers, the award-winning Destin Commons sets the standard as Northwest Florida’s leading open-air mall and lifestyle center. It offers more than 70 stores and restaurants, including Bass Pro Shops, Belk and the AMC Destin stadium style movie theatre. Spend some time here with family and friends. At 4100 Legendary Drive. Suite 270, Destin, FL 32541, (850) 337-8700. Silver Sands Premium Outlets – 110 Outlet Stores, including Banana Republic, Brooks Brothers, Calvin Klein, Cole Haan, DKNY, Gap Outlet, J.Crew, Kate Spade, Michael Kors, Nautica, Nike, Polo Ralph Lauren, Saks Fifth Avenue Off 5th, Tommy Hilfiger and more. Great buys, so shop to your heart’s content. At 10562 Emerald Coast Parkway Destin, FL 32550, (850) 654-9771. Grand Boulevard at Sandestin – Offering a truly elegant shopping and dining experience, Grand Boulevard is home to some of the most popular hotels in Destin, and the unique Town Center offers exclusive shops, fine dining and special events. At 600 Grand Blvd Suite 203, Miramar Beach, FL 32550, (850) 654-5929. The Links Golf Club (at Sandestin Golf and Beach Resort) — 165 Sandestin Blvd N, Destin, FL 32550, (850) 267-8144. Raven Golf Club (at Sandestin Golf and Beach Resort) — 1199 Troon Dr, Miramar Beach, FL 32550, (850) 267-8155. Baytowne Golf Club (at Sandestin Golf and Beach Resort) — 199 Troon Dr, Miramar Beach, FL 32550, (850) 267-8155. Burnt Pine Golf Club — 9300 Us Highway 98 W, Destin, FL 32550, (850) 267-6500. Regatta Bay Golf & Country — 465 Regatta Bay Blvd, Destin, FL 32541, (850) 337-8080. Kelly Plantation Golf Club — 307 Kelly Plantation Dr, Destin, FL 32541, (800) 811-6757. Royal Palm Spa — 4201 Indian Bayou Trl, Destin, FL 32541, (850) 351-0600. The Emerald Sanctuary — 180 Poinciana Blvd Ste 4, Miramar Beach, FL 32550, (850) 420-3070. Surfside Spa — 1096 Scenic Gulf Drive at Surfside Resort, Miramar Beach, FL 32550, (850) 543-7905. Serenity by the Sea — 4000 S Sandestin Blvd, Destin, FL 32550, (850) 622-9595. Fusion Spa Salon Sandestin — 600 Grand Blvd Ste 102m, Miramar Beach, FL 32550, (850) 654-2444. Avantgarde Salon Inc — 36236 Emerald Coast Pkwy, Destin, FL 32541, (850) 654-5057. Massage Therapy By Blaine and Company — 12815 Emerald Coast Pkwy, Miramar Beach, FL 32550, (850) 837-2002. Destin and the surrounding areas have what many consider the perfect coastal lifestyle choices. Be good to yourself. Visit Paradise….